Spiritual Guidance Embodied in the Sermon on the Mount. "Do not I fill heaven and earth?" says the Lord in Jeremiah 23:24. The all-seeing, all-blessing Presence of God is pervasive everywhere. The faith in our hearts feels Him. Our devotion, when deepened, enables us to experience Him. Our inner spiritual vision beholds Him everywhere. He is in all places, at all times, in all conditions. Being infinite and present everywhere, He encounters us, wherever we be, in the scheme of His visible or invisible worlds. No one can drift beyond His all-merciful Heart, His all-seeing eyes, and His all-blessing hands. Perceiving this grand divine truth, David says in Psalm 139, 7-10: "Whither shall I go from thy spirit? or whither shall I flee from thy presence? If I ascend up into heaven, thou art there; if I make my bed in hell, behold, thou art there. If I take the wings of the morning, and dwell in the uttermost parts of the sea - even there shall thy hand lead me, and thy right hand shall hold me." Thus, we see, the Lord's Presence is everywhere. The Kingdom of Heaven is accessible to every aspiring heart of love. In the decades and centuries past, many have known Him, and in the decades and centuries later, many will know Him. We are in Him, though our dull senses do not enable us to know Him. Yet, such is the Mercy of God that we carry in ourselves all the capacities needed for knowing Him. God's Grace and all-seeing and all-illuminating Light was, is and will always be, in all places, and is experienceable by everyone who opens himself to it. When devotion blooms in our hearts, we grow sensitive to the all-blessing Presence of God. When we satisfy the conditions of true spiritual life presented in the Sermon on the Mount, it is then that we have the requisites for beholding the Kingdom of Heaven everywhere, we acquire the needed sensitivity and inner spiritual Grace, illumination necessary for conversing with God, minute by minute. The entire nature reveals to us God's eloquent Presence. In every being, we begin to behold the Kingdom of Heaven. Everything on earth discloses to us the grand and all-transforming Presence of the Divine. The very aspirations in your heart, and the spiritual sensitivity in you, which prompt you to visit the Churches, are themselves a clear evidence for the Presence, and operations, of God in you. The wonderful evidences of the divine Presence are visible everywhere to the discerning, and the spiritually sensible. There are no conditions and circumstances in which we cannot be in tune with the Presence of the Divine. Therefore, in the Proverbs 3:6 we find, "In all your ways, acknowledge Him!" Acknowledge Him through your prayers, and in all that is beautiful and noble. Acknowledge Him in the wonders open to your view, in the creation. Acknowledge Him in His own living Image that God has lodged in every being. Acknowledge Him through your daily works, and through the noble forms of your everyday living. Acknowledge Him through the expressions of your love, through the development of your faith, through the attendance at the services in the Church, and through the noble actions in everyday living. Acknowledge Him by knowing Him to be always with you. Since all gifts, as the Bible makes it clear to us, are from God, acknowledge Him in the benevolent geniuses of the world. Acknowledge Him in all that is most valuable for human development and spiritual progress. Acknowledging is the same as growing responsive, perceiving, recognizing, beholding, adoring. Acknowledge Him in all manner of your ways. Behold the Presence of God in the affections of the parents, in the innocence of the children, in the services and sacrifices of the good, in the holiness of the Christian monks and nuns, and in all that expresses Love, Light, Peace, Wisdom, Sweetness, Beauty. Acknowledge His Presence in all manner of ways, and thus enrich your life. In our daily life in this restless, noisy, busy world, contact and communion with God's Presence can be established in hundreds of ways, and through all these modes of acknowledgement of God's Presence as the sustaining Essence within us, and as the all-seeing Being around us. Our daily entrance into the Church and the services that we attend, constitutes one of the grand means. Our study of the great spiritual truths and revelations presented in the teachings of the Bible, and the assimilation of the light laid in them forms another way of acknowledging God. Our love for the neighbour, our recognition of the Presence of God in the inner spiritual Essence of the neighbour, and our capacity to love that neighbour for the sake of God's Presence in him, - our recognition that by following the footsteps of Jesus Christ, any person, however sinful he may be, shall be redeemed and saved, - is another way of acknowledging God's Presence. Another method by which we try to put ourselves in contact with God's Mercy, Love, Grace and Light, lies in our readiness to grow responsive to the wonderful message Brother Klaus* has conveyed to us, through his own life, works and efforts. To try to live in the spirit of oneness among ourselves, and extend our goodwill and our love to all, irrespective of what they are on the surface, in their outer nature, is a typically spiritual and Christian way of coming closer to the experience of God. The true Christian spirit consists in forgiving and forgetting. It lies in the purity of heart that discards the superficial differences, and, like Brother Klaus, finds the oneness of humanity in God. Primarily it is a spiritual attitude that makes everywhere peace, order, happiness, harmony. As a matter of fact, the entire human life, in all its conditions and circumstances, is a grand opportunity for the acknowledgement and adoration of God's Presence. The very weaknesses of our life require of us to relate ourselves to, and touch, that which is the Highest Power in ourselves, and to gain strength, peace, life, light, joy, by consciously recognising and acknowledging that which is infinite Peace, Light, Joy, Perfection, - God in us, and around us. The Bible makes no compromises to human weaknesses, and conclusively declares the truth for the welfare of mankind, that we should seek the Kingdom of Heaven first, and all else shall be added unto us. Nothing else can really secure true peace or progress for mankind, except it be the Love and the Wisdom given by Jesus Christ. Unless the heart is enlivened by the love of God, unless there is some kind of inner contact with God, all our splendid ways of making our lives happy on earth, will fail, and where they do not fail instantly, they leave us with a devastation after deceiving us with an apparent, specious, empty success. All that is done every day in the world, in order to create an earthly paradise, can be truly successful, and sustained, only by the Grace of God: and, the Grace of God belongs only to a truly Christian heart, a heart that is ruled by love, a heart that is given over in devotion to God, a heart that is surrendered to the Divine. Around the globe, we see today that the great statesmen of the world, the world's governments, the international organisations for world peace, the best and the leading personalities in all nations, have failed in establishing peace and harmony here on earth. Today, all around us, in the world, there is disorder, unhappiness, misery, suffering, restlessness, war, fire, flames and death. This will continue, unless the human individual fulfils some of the fundamental requisites of Christianity, seeks to abide by the spirit of the Sermon on the Mount, turns to God for Grace and help, and pursues spiritual values. The future of Christianity shall be more glorious than its past, if it seeks to make manifest its essential genius, and contributes to human order and peace, by the manifestation of all that is great, dynamic and transforming in its spiritual genius. In the world today, all true lovers of the Bible, the Church, God and Jesus Christ, have a heavy responsibility that consists in displaying a daily conduct which is in harmony with the teachings of Jesus the Christ. Our personalities have to be dynamised with a consciousness of God. We have to distinguish ourselves as peacemakers, truly poor in spirit, and really hungering after the righteousness which God's Kingdom is. Let our conduct in the private and public life be an illuminating illustration to the world, of the nature of the true harmonizers and real and effective promoters of the spirit of oneness. And our first loyalty should remain to God, the foundation of our existence, value, joy, freedom, perfection; to Jesus Christ who is the Way of Love, Peace, Truth, Wisdom that leads us to the divine Perfection; and to the Church built by devotion, faith and self-surrender to God; and to the fundamental spiritual values and truths which alone can yield a solution to the essential and grand problems of our everyday life. Our civilization and our sciences have no resources in themselves, to provide effective solutions to the basic problems of human life. Biology has no knowledge concerning the essential nature of existence. However wondrous the present and future advancement of our sciences, they have no essential light for resolving the fundamental problems of life. None of the modern sciences can claim a true insight into the basic difficulties of human existence on earth. A true insight into the nature of human life and its problems, is embodied in the heart of Christianity which bears the blazing Light and redeeming Love of Jesus the Christ. And therefore, Christianity has a distinctive role to play, and has to execute a glorious mission, today and in the future, in furnishing adequate solutions to the fundamental problems of existence. The grand social values of Christianity can derive true sustenance, and obtain real fulfilment, only by their relation to the spiritual Essence of Christianity. In truth, and in spirit, we shall be Christians, only by an uncompromising devotion to the central teachings of Jesus Christ. Our strength rests upon our contact, and communion, with God. The power and vitality of our personalities in everyday living, can arise only from an assimilation of the dynamic teachings of the immortal Master of mankind that Jesus the Christ is. "Seek ye the Kingdom of Heaven first, and all else shall be added unto you." All that we have achieved today, through the wonders of our technological and scientific civilization, can be retained, and fruitfully used, only by the development of that love which the Bible advocates, by the inner sense of the divine Presence, through some kind of inner contact with the all-nourishing, all-sustaining, all-protecting Divinity. The true leaders who liberate mankind, and grant it real freedom, peace, joy, are essentially spiritual individuals. The greatest statesmen of the world have never been able to achieve what Jesus Christ has achieved in three years of his ministry, and the secret of that achievement rests upon His contact with God, the Father. The unbreakable relationship that has subsisted between Jesus Christ and God, became the immortal foundation of everything that He has built up during the short period of His mission on earth. If only we have a little of the love that He embodied in Himself, and practise His precepts on love for God, and for humanity, we would be truly receptive to the expression of His Grace, and become effective instruments for the building of the Kingdom of Heaven here on earth. 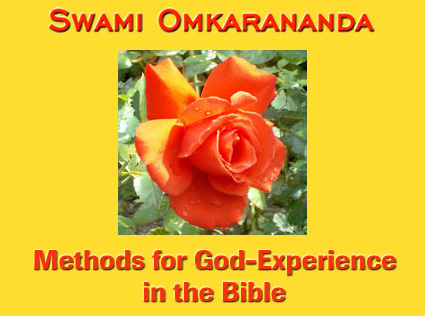 Since, as the Bible renders it very clear, the Presence of God is infilling heaven and earth, and since the Bible has also given us the methods by which we can contact, and commune with, this Presence of God, - methods such as acknowledging the Presence of God in all manner of our ways and living, being still, rendering the eye single, loving God with all our heart, soul, might, - it is possible for each of us fruitfully to contact the Kingdom of Heaven first, and retain every blessing of life here in the material universe, and have all else added unto us. There are other ways by which we can contact God, and receive the abundance of His Grace and blessings. The apostle Paul says, "Pray unceasingly". One of the wonderful ways of keeping ourselves minute by minute in contact with the Presence of God, is the art of unbroken inner prayer. Something in our heart and in our inner being must be constantly in a state of prayer. This unceasing inner praying relates our soul to the Kingdom of God, and makes our outer life a great blessing for ourselves and for others. The Love of God, that is being continually vivified by the inner prayer of the heart, enriches us in a way that nothing else can ever do. It renders our life richer and abundant in sweetness, peace, intelligence, abilities, energies, the wonder-working higher consciousness. "Herein is my Father glorified, that ye bear much fruit." John 15:8. The Bible also asks us to worship in truth and in spirit. That is the true worship. It is no worship if our bodies are in the Church, and our spirit, our mind, is elsewhere. We have to adore God in spirit and in truth. The right and most effective way, the instantly effective way, to adore God is as Jesus Christ says, to adore God with all our heart, mind and soul. "Love the Lord thy God with all thy heart, with all thy soul, and with all thy mind." Matthew 22:37. Our heart should be there where our lips move in prayer. In truth, in love, in devotion, we have to worship the Divine. Thus, we find, the Bible is very rich in the methods for the experience of God in daily life, which it implicitly presents. Cultivation of inner stillness and calmness is essential for spiritual development and growth. Therefore, one of the methods that the Bible gives us, is, "Be still and know that I am God" Psalm 46:11. Our inner nature has to be rooted in calmness and stillness. We can never have real stillness and calmness inside ourselves unless our nature is dominated by a dynamic sense of the all-perfect divine Presence, unless the heart opens itself up in love, and our nature is radiant with faith and self-surrender to that Power which, being the Life of our own life, protects us, exalts us and infinitely enriches us. When there is real and manysided inner calmness, the transforming knowledge of God is obtained. Inner silence, stillness, calmness cause the proper circumstance in our experiencing consciousness, for knowing God. When we are troubled by disturbing and distracting thoughts, we will not be responsive, or sensitive, to the Presence of God, - much less understand the glorious and revealing truths that the pages of the Bible unveil for the spiritually awakened, and conceal from the dull eye of a soul that is irresponsive, wanting in the inner refinement, faith, love, understanding, and fundamental decencies of life. two, the sense of security that arises from the awareness that we are formed by the eternal and indestructible breath of God, and that God with all his omnipotence is protecting us, from every side. Development of stillness is a precondition of the unfoldment of the divine nature and the reception of the divine Grace. Perception is blurred by distracting thoughts, disturbing feelings, and the dark workings of the subconscious. Unless they are stilled for a while, the face of the Truth does not grow clear. When they are transformed and turned into a radiant, luminous, pure nature, after years of spiritual progress and development, we come face to face with the all-marvellous God. Added to these methods, there are practices implicit in the Beatitudes of the Sermon on the Mount. Followed earnestly, faithfully, zealously, these Beatitudes secure for us tremendous spiritual progress, enable us to inherit the earth and gain the Kingdom of Heaven. In daily life, we encounter some exceptionally good people who illuminate and illustrate to some extent, in their own lives, the practicability and the supreme value of the Beatitudes. The promises of Jesus Christ to the human individual, are ultimate. He has, in Love, and in Light, delivered to us an all-sufficient Message. We shall be called the sons and daughters of God, we shall be known as the salt of the earth and light of the world, when we daily seek to purify our hearts, and discard from our existence the ugly workings of the ego and the pride; when we seek to hunger for that which sustains life and enriches it infinitely. Blessed are we, for, we have Jesus Christ as the Truth, the Way and the Life eternal. Through his life and mission we are provided with all that is essential for flowering into the perfections of the Father in Heaven. In spirit and in consciousness, it shall be my prerogative and delightful duty to visit this Chapel*, every day, and conduct my humble and special prayers for the health, long life and inner spiritual progress of all of you, and for the abundant descent of the Grace of Jesus and God upon all of you. *This talk was one of a series delivered at the Brother Klaus Chapel in Frauenfeld, in 1968. Brother Klaus is the Swiss patron saint, St. Niklaus von Flüe.